Free agent defensive tackle Terrance Knighton is retiring after eight NFL seasons, reports Adam Schefter of ESPN (Twitter link). The 30-year-old will pursue a career in coaching, Schefter adds. A third-round pick out of Temple in 2009, Knighton spent the first four years of his playing career with the Jaguars before signing with the Broncos in 2013. Knighton was at his best in Denver, where he started in all 32 of his regular-season appearances overall and, in 2014, was part of the NFL’s second-best run defense. The man known as “Pot Roast” finished as Pro Football Focus’ 12th-ranked D-tackle that year, and he left the Broncos the next offseason to sign with the Redskins. Knighton started in all 15 of his appearances in Washington in 2015, which will go down as his final season. Although he inked a one-year, $4.5MM deal with the Patriots last April, he was unable to make the eventual Super Bowl champions’ roster. They cut Knighton prior to Week 1, and he nearly went on to reunite with the Redskins. However, no deal materialized after he met with them in October. Knighton’s career concludes with 108 appearances, 96 of which were starts, as well as 14 sacks. PFR wishes him well as he looks to enter the coaching ranks. Could Pot Roast return to D.C.? 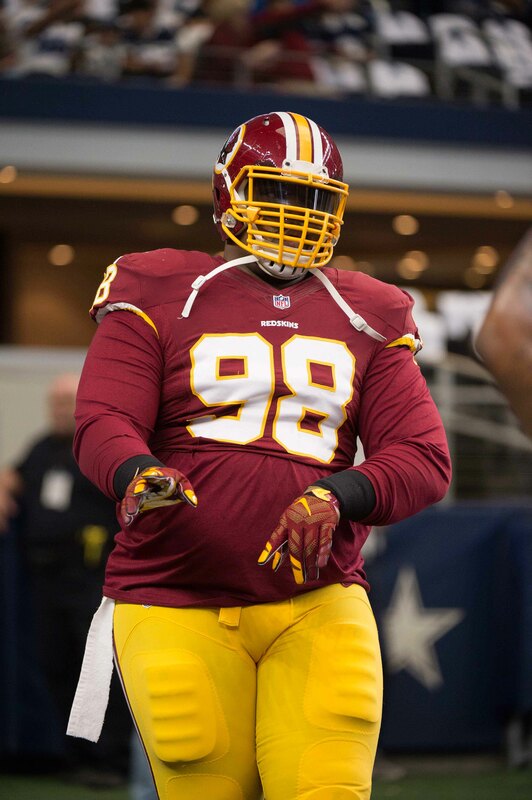 Today, the Redskins are hosting Terrance Knighton on a visit, as Mike Jones of The Washington Post tweets. With Knighton and Phil Taylor in town, the Redskins are clearly looking to bolster the interior of their defensive line. After finishing his contract in Denver, Knighton was expected to cash in following the 2014 season. Instead, he found a mild free agent market and settled for a low-priced one-year deal with the Redskins. As a nose tackle in Washington’s 3-4 scheme, Pot Roast logged 29 tackles and 1.5 sacks in 2015. Although he didn’t have quite the same impact last year that he did during his final season as a Bronco, Knighton ranked in the top half of Pro Football Focus’ list of qualified interior defenders, placing 58th out of 123 players. Predictably, PFF assigned Knighton a much better grade as a run defender than as a pass rusher. This past offseason, he hooked on with the Patriots but was released in late August. Knighton’s release came as something of a surprise, especially given the Pats’ depth concerns on the defensive line. Now, the Redskins need some veteran help on the D-Line and he could circle back there. The Patriots have had enough Pot Roast. Veteran defensive lineman Terrance Knighton was released by the Pats this morning, as first reported by Knighton himself on Twitter. By cutting Knighton, the Pats save $900K in salary and $3MM in bonuses. This offseason, the Pats inked Knighton to a one-year, $4.5MM deal. However, he struggled in the team’s second preseason game against Chicago and he did not log a single defensive snap during New England’s third preseason contest against Carolina on Friday night. Knighton found himself slipping on the Pats’ depth chart in recent weeks and his salary was no longer justifiable for the team, even though they have seen stars like Rob Ninkovich go down with injuries. Knighton, who started his career in Jacksonville, spent two seasons in Denver before heading to Washington for the 2015 campaign. The 30-year-old has been very durable in his first seven NFL seasons, appearing in 108 total regular-season games, including 96 starts. A nose tackle in Washington’s 3-4 scheme, Pot Roast logged 29 tackles and 1.5 sacks in 2015. Although he didn’t have quite the same impact last year that he did during his final season as a Bronco, Knighton ranked in the top half of Pro Football Focus’ list of qualified interior defenders, placing 58th out of 123 players. Predictably, PFF assigned Knighton a much better grade as a run defender than as a pass rusher. The Patriots now must release six more players by 3pm CT on Tuesday in order to reach the 75 man max. Photo courtesy of PFR on Instagram. The Patriots signed Terrance Knighton to a one-year, $4.5MM deal this offseason to serve as a key cog in the interior of the club’s defensive front, but now Pot Roast is in danger of being cut, as Kevin Duffy of MassLive.com writes. Knighton struggled in the team’s second preseason game against Chicago, and he did not log a single defensive snap during New England’s third preseason contest against Carolina on Friday night. If Knighton does indeed receive his walking papers, he should be able to find work with a club looking for a dependable and durable run-stuffer. It’s looking more and more like Patriots WR Danny Amendola will stay on the PUP list and miss at least the first six games of the regular season, according to Ben Volin of The Boston Globe. The Patriots had assigned rookie corner Cyrus Jones the same grade as several other players who were still available when the club was set to make its first draft pick (No. 60 overall) this year. As Mike Reiss of ESPN.com writes, the team selected Jones because of his dynamic return ability, which he demonstrated in a big way with a 60-yard punt return Friday night. Reiss points out that Jones taking over the role could help preserve 30-year old returners Julian Edelman and Amendola from taking additional pounding. Trevor Siemian likely cemented his status as the Broncos‘ starting quarterback after turning in a solid performance during last night’s preseason victory over Los Angeles, Mike Klis of 9News.com writes. At this point Klis would be surprised if the Broncos didn’t release Mark Sanchez, a move that would save the team $4.5MM and a seventh-round pick. Troy Renck of Denver7 believes that Tavon Austin‘s new four-year, $42MM deal with Los Angeles will set the floor in Emmanuel Sanders‘ contract negotiations with the Broncos (Twitter link). As Renck observes, Sanders is older than Austin, but his production level has thus far been superior. Danny Woodhead is entering the final year of the two-year extension he signed with the Chargers in 2014, and he would like to remain with the club long-term, as Michael Gehlken of The San Diego Union-Tribune writes. However, contract talks between team and player prior to training camp were unproductive, with the Chargers determining it was not in position to extend Woodhead for a variety of cited factors, including cash committed to other contracts this year. Woodhead, though, will not publicly comment on his contract situation, and simply indicated a desire to focus on the 2016 season. Greg Hardy is frustrated that Aldon Smith received a sizable contract from the Raiders while he continues to sit on the shelf, sources tell Jason Cole of Bleacher Report (video link). Hardy’s camp is still expecting to land an incentive-laden deal, but interest has not been strong up until this point. According to league sources who spoke with Cole, teams are more concerned about Hardy’s attitude in Dallas last season and stories of his partying than they are about his domestic-abuse allegations. Here’s some more news from outside the draft realm. Family members are pestering Vikings defensive end Brian Robison to find out about his NFL future and while he’s not certain of what will come next, he does have an idea of what he’d like to do. Robinson says his “ultimate hope” is to play out the remaining two years on his deal, as Chris Tomasson of the Pioneer Press writes. The veteran is due to earn a base salary of $3.75MM in 2016 and $5.25MM in 2017. Robison racked up at least eight sacks per season from 2011-13. After that, he recorded 4.5 sacks in 2014 and 5.0 sacks last season. For his efforts in 2015, the advanced metrics at Pro Football Focus rated him as the 19th-best defensive end out of 48 qualified players. 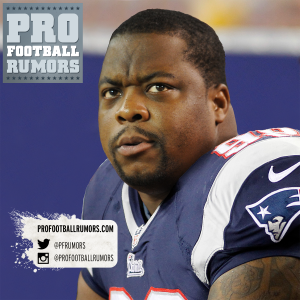 Terrance Knighton consulted Vince Wilfork before signing his one-year deal with the Patriots, according to Mike Reiss of ESPN.com. A Windsor, Conn., native, Knighton grew up a Patriots fan and followed Wilfork’s career closely. Despite being released last year after 11 seasons in New England, Wilfork expressed consistent praise for the Patriots in a long conversation with Knighton, Reiss reports. Andy Mulumba‘s one-year deal with the Chiefs is worth $620K, according to Rob Demovsky of ESPN.com. The outside linebacker’s deal is only guaranteed for $10K, however. Mulumba also gets a $10K workout bonus to go along with his $600K base. The native of the Democratic Republic of Congo became a free agent when Green Bay declined to extend him the low-round tender. In a recent mailbag, a reader asked Brad Biggs of the Chicago Tribune whether the Bears would give up their first-round pick for Jets defensive lineman Muhammad Wilkerson. The Jets are willing to entertain trade offers from Wilkerson, but they’re not desperate enough to move him cheaply. Chicago, meanwhile, likely needs to build through the draft for a few years to put their plan in motion, and a Wilkerson deal would probably weaken its stockpile. Before Ifo Ekpre-Olomu was claimed off waivers by Miami, the Saints, Bills, and Steelers all tried to claim him, a source tells Field Yates of ESPN.com (on Twitter). Here are the latest details on recently signed or agreed-upon contracts from around the NFL. All links are courtesy of Aaron Wilson of the Houston Chronicle unless otherwise indicated. Aldon Smith, OLB (Raiders): Two years, $11.5MM. Annual salaries of $1.25MM. Up to $4MM annually in per-game roster bonuses. $500K annual workout bonus. Up to $3.5MM in annual incentives (Twitter link). Vernon Davis, TE (Washington): One year, $2.4MM. $500K signing bonus. $600K of $1.35MM base salary is guaranteed. $150K roster bonus due on August 22. Up to $300K in per-game roster bonuses. Up to $2.1MM in incentives (Twitter links). Terrance Knighton, DT (Patriots): One year, $2.018MM. $250K signing bonus. Up to $500K in per-game roster bonuses. $100K workout bonus. Up to $300K in performance incentives. Up to $2MM in playing-time incentives. $500K Pro Bowl incentive (links via Mike Reiss of ESPN.com and Ian Rapoport of NFL.com. Stefen Wisniewski, C/G (Eagles): One year, $1.51MM. $500K signing bonus. Up to $250K in per-game roster bonuses. Up to $1.25MM in incentives (Twitter link via Mike Garafolo of FOX Sports). Wallace Gilberry, DE (Lions): One year, $1.25MM. $340K signing bonus. $25K workout bonus. Up to $500K in incentives for performance and playing time (link via Dave Birkett of the Detroit Free Press). Jack Crawford, DE (Cowboys): One year, $1.1MM. $240K signing bonus. $100K workout de-escalator. Up to $500K in incentives (Twitter link). Spencer Paysinger, LB (Dolphins): One year, minimum salary benefit. $80K signing bonus. $120K of $760K base salary is guaranteed. (Twitter link). Kyle Love, DT (Panthers): One year, minimum salary benefit. $80K signing bonus (Twitter link). APRIL 4th, 4:58pm: The Pats formally announced the Knighton deal, as Ben Volin of The Boston Globe tweets. MARCH 31st, 5:54pm: It’s a one-year, $4.5MM deal, according to Ian Rapoport of NFL.com (on Twitter). 5:04pm: Pot Roast has reached his verdict. Terrance Knighton has been deciding between offers from Washington and the Patriots this week and he has decided to join New England, according to Dianna Marie Russini of ESPN.com (on Twitter). Knighton, who started his career in Jacksonville, spent two seasons in Denver before heading to Washington for the 2015 campaign. The 29-year-old has been very durable in his first seven NFL seasons, appearing in 108 total regular-season games, including 96 starts. A nose tackle, in Washington’s 3-4 scheme, Pot Roast logged 29 tackles and 1.5 sacks in 2015. Although he didn’t have quite the same impact last year that he did during his final season as a Bronco, Knighton ranked in the top half of Pro Football Focus’ list of qualified interior defenders, placing 58th out of 123 players. Predictably, PFF assigned Knighton a much better grade as a run defender than as a pass rusher. Last offseason, Pot Roast was expected to net a sizable deal but wound up having to settle for a one-year, $4MM pact from Washington. The six-year veteran was an integral part of a Broncos team that had the league’s second-best run defense in 2014, and Pro Football Focus (subscription required) rated Knighton 12th among 81 qualifying D-tackles. He’ll now try to get back to his 2014 form in New England. The Patriots don’t run a 3-4 base, so he won’t be playing quite the same role that he did in D.C. Still, New England is in need of big bodies up front, having lost Akiem Hicks and Sealver Siliga in free agency earlier this month. Mike Reiss of ESPNBoston.com weighs in on Patrick Chung‘s recent contract extension, observing that the Patriots took the $1.8MM that Chung was likely to earn in playing-time incentives in 2016 and 2017 and turned it into a $1.8MM signing bonus, along with an extra $600K. In return, Chung added one year to his contract, keeping him under club control through 2018. New England, as Reiss notes, frequently turns incentives into signing bonus money as part of a win-win strategy that makes the player happy by giving him upfront cash and makes the team happy by keeping a productive player in the fold for another season. The extension was therefore not, as some have suggested, a simple display of generosity on the part of the Patriots as a reward to Chung for a job well done; there are rarely any giveaways in Foxborough, and the Chung contract was no exception. In the same piece, Reiss opines that the one-year, $4.5MM deal Terrance Knighton recently inked with New England sounds a little high, given that the team was unwilling to make that kind of commitment for Akiem Hicks and Nick Fairley and consequently missed out on both players. Reiss believes that Knighton’s base pact is more likely to be closer to $2MM, with realistic incentives that could push it to $3MM and less realistic incentives that could max out at $4.5MM. Knighton is just the latest in a long list of defensive tackles who sign on with the Patriots in the latter stages of their careers hoping to rekindle or continue their success, as Christopher Price of WEEI.com writes. Keith Traylor, Ted Washington, Shaun Ellis, Albert Haynesworth, Andre Carter, Tommy Kelly, and Alan Branch have all landed with New England relatively late in their careers, and you can pretty much count on New England bringing at least one such player aboard every offseason. Just as the Patriots converted some of Chung’s incentives into a signing bonus, Ben Volin of The Boston Globe believes the team will likely do something similar in the near future with Rob Gronkowski and Julian Edelman. Volin writes that New England will probably take future base salaries for Edelman and Gronkwoski–both of whom are significantly underpaid when compared with the going market rate for their respective positions–and convert them into signing bonus money in an effort to keep them happy and focused. Volin does observe that the Patriots have already prepared for Gronkowski and Edelman to be at least little unhappy with their current deals. The contracts for both players call for $250K workout bonuses for attending 90% of the team’s offseason practices, by far the highest workout bonuses of any Patriots player, so if they were to protest their contracts by skipping offseason workouts, they would miss out on a fair amount of money.